My sister’s to be exact. If you’ve been following my blog for any time (or you know, read the Who Am I? page), you’ll know that my sister is gluten-, soy-, and dairy-free per her doctor’s orders. That obviously makes things tricky on any occasion, a birthday celebration is even harder. 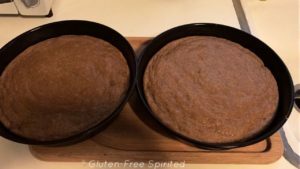 Some cake mixes are gluten and/or dairy free, but still had soy (like many gluten-free products do). Lo and behold, Namaste Foods has a cake mix that’s free from top allergens! When I say free from top allergens, there are 14 (!) 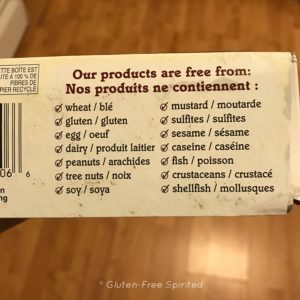 allergens that their products are free from. Namaste Foods is free from top allergens…14 of them to be exact. 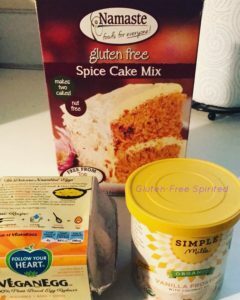 Nikki chose their Spice Cake Mix. Usually when you think of spice cakes, you associate it with cream cheese. We’ve yet to find a cream cheese frosting that meets Nikki’s requirements. Frosting options seem to be even more limited than cake mix options. After doing some research, she came across Simple Mills . If you’re not familiar with their products, they are gluten-, soy-, and grain-free while also being paleo friendly and contain no GMOs. 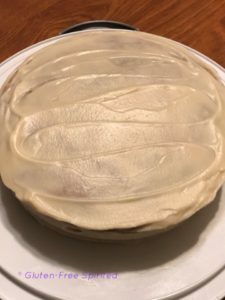 Simple Mills has a new vanilla frosting. Not only does it meet all of Nikki’s requirements, but it’s free of corn, gums and emulsifiers. You’re making a cake, what about eggs? We don’t need traditional eggs, silly. Another company that is found in this house is Follow Your Heart. 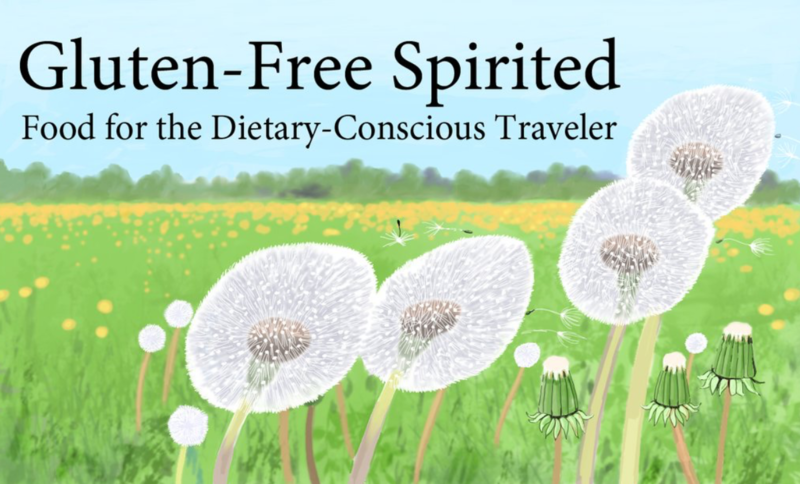 This company makes a variety products including Vegan Gourmet Dairy Alternatives, such as Vegenaise, and natural and organic salad dressings. One of their new products is VeganEgg, a 100% plant-based egg replacer. Pro Tip #1: Want fluffier eggs? Use a blender. So now you have your cake mix, egg replacement, and frosting. You’ll also need oil (we used coconut oil). 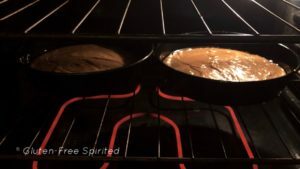 These three ingredients will make a two layer cake. -Pre-heat the oven to 350 degrees. -Add cake mix and blend well. Patty-cake, patty-cake, bake me a cake. Pro Tip #2: Put frosting in the microwave for 30 seconds (adjust as you see fit) to loosen icing to make it easier to spread. Put the cake in the fridge for a minimum of 10 minutes to let frosting set. Verdict: The cake is very good! My mom, sister, and I all approve! Yes, that’s Ariel on the plate. Wanna fight about it? If you liked this recipe, you may also like Quick Meal: Easy & Cheezy (Mac) for the Dietary-Conscious, How to Make Dietary Restriction Friendly Penne Pasta, and Tacos for the Dietary-Conscious Eater. As always, don’t forget to follow GFS on social media. 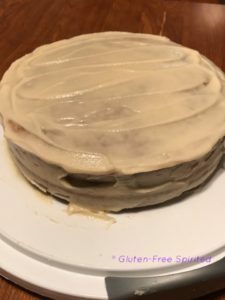 I made an allergen-friendly cake a few weeks back, that I AIR-FRIED! It was the best thing I ever made (sweet style) – hollyyyyyy moly! That sounds amazing and I need to read your blog on it ASAP! Hey. I’ve never heard of air-fried. I have to look that up. 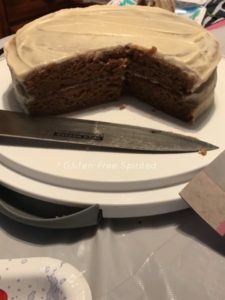 So helpful for those who need a really yummy vegan or GF cake! Thank you, this will be so helpful for my friends and family that have health problems.. and eventually me whenever i give up all the super sweet food, lol! Thanks I’ll def pin! You’re welcome & thank you for pinning this! 🙂 Hope this comes in handy for you! Always on the hunt for a good GF cake recipe!! Can’t wait to give it a go! I’ve seen the Namaste brand and I want to say in Wholefoods. I’ll try to look for it next time I go. Hopefully you find it! I think you’ll like it! I’m happy to hear that! Let me know what you think! I have never used the ‘vegan egg’ I always use the ground flax and water egg. I must try this! This was our first time using it. We liked it! Great info!! And feel free to make your name a little bigger on pictures, all this info, people need to know where to find you! This is so interesting! 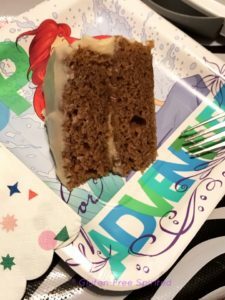 This cake looks like it has a nice texture and well as moist. I like vegan food never seem a vegan egg need to look into this. It did have a nice texture & was moist. This was the first time we’d heard of VeganEgg and it worked really well. It’s easy to use too! Awesome cake for those who love sweets and wants to keep their figure. Nice recipe.